The project “Rome seen by the blinds” is part of a social innovation strategy aimed at “Writing stories in Rome's geography. For an experiential map of the city”. The project is realised by Urban Experience with the support of Fondazione Roma-Arte-Musei. Peculiarity of “Rome seen by the blinds” is the use of the geoblog: a particular map, written on the basis of experiences undertaken by the blind communities of the S. Alessio Institute for blinds in several points of the city: Tuscolana, Aurelio, Tridente, Tor Marancia. Audio reports have been produced, related to some of the explorations conducted in the various territories for probing their accessibility and interpreting them through the blind people's perception. Thanks to these actions, many stories have been collected, inscribed then in maps to be consulted online, with smartphones too. Such urban explorations were carried on with a particular ludic-participative format, the radio-walkshow, walk combined with a radio-system that enables to converse while walking and to listen to audio recordings about the itinerary, which are like memory fragments of those territories lived by blinds of different generations. Along the paths, signs with braille writing and mobtags (also called QR-codes. In this case digital codes linking to the geoblog with audio clips placed on sound clouds) were set up. 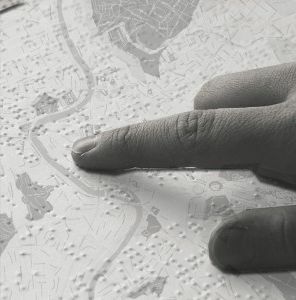 The launch of the project “Rome seen by the blinds” gave rise to a debate around general themes of “design for all”, social innovation topic for the planning of spaces, products and services usable by all, starting from blind people.